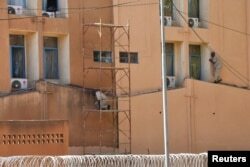 The governments of Burkina Faso and France said an armed group coordinated attacks Friday on France's embassy and cultural center and on the West African country's military headquarters in the capital, Ouagadougou. The Burkina Faso government said at least eight soldiers were killed as well as eight assailants — four at the embassy and four at the military headquarters. Media reports citing other sources said the death toll could rise. An aide to French Foreign Minister Jean-Yves Le Drian said the situation at France's embassy and cultural center was brought "under control" after the gunmen who attacked the embassy were killed. But gunfire erupted again later in the day at the country's military headquarters in western Ouagadougou, where the other attackers were killed. Information Minister Remis Fulgance Dandjinou said there was no official tally of civilian casualties but added that the municipal stadium in the center of the capital had received dozens of wounded. At the start of the Friday attacks, witnesses said, armed men got out of a car and opened fire on passers-by before heading to the embassy. An explosion occurred at about the same time near the military headquarters and the French cultural center about a kilometer from the embassy attack, witnesses said. Men escape from Burkina Faso's army headquarters during an attack in the capital, Ougadougou, Burkina Faso, March 2, 2018. Aristide Voundi, a milkman who was near the army headquarters when the attack occurred, told VOA, "I heard a loud noise in that area and I saw black smoke. My ears were buzzing. I got scared. I took off and I saw people running. It was panic in the city." Homemaker Sanou Safiatou said she was in the city when she heard an explosion, which triggered a scramble for shelter. "We were really afraid" and "the traffic was dense," she said. "It was chaos." Dandjinou said earlier on state television channel RTB that the attacks had "strong overtones of terrorism," and a prosecutor in Paris said an investigation had been launched into "attempted murder in relation to a terrorist enterprise." French President Emmanuel Macron's office said he was following the situation, and France urged its nationals to avoid the city center. A message posted on Facebook by the French Embassy said, "Attack under way at the French Embassy and French Institute. Stay indoors." There was no immediate claim of responsibility for the incident. The city has been attacked at least twice in the past few years by Islamic extremists targeting foreigners. Burkina Faso is among a number of vulnerable countries in the southern Sahara region that are fighting jihadist groups. VOA French to Africa Service's Bagassi Koura contributed to this report.